The object of the game is to rescue Robin by collecting the seven parts of the Batcraft hovercraft that are scattered around the Batcave. The gameplay takes place in a 3D isometric universe, which programmers John Ritman and Bernie Drummond would further develop for 1987's Head Over Heels, and is notable for implementing an early example of a system that allows players to restart from an intermediate point in the game on the loss of a life rather than returning all the way to the start (in this case the point at which Batman collects a "Batstone"). 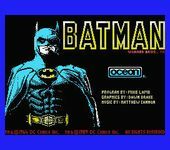 Batman was received well by the computer game press at the time. Crash gave it a rating of 93%, Your Sinclair scored it 9/10 and Sinclair User gave it five stars and rated it as a "classic". Source: Wikipedia, "Batman_(1986_video_game)," available under the CC-BY-SA License.